A Perseid meteor shines over medieval Albrechtsberg castle near the town of Melk, Austria. Constellations Aquarius, Aquila, Delphinus (above and right of center) also appear in this skywatching photo. Astrophotographer Sebastian Voltmer took this image on Aug. 12, 2012. 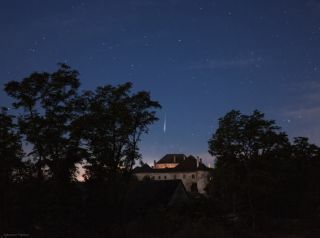 A shining Perseid meteor flies on a clear night sky over medieval Albrechtsberg castle near the northern bank of the Pielach river near Melk, Austria. Photographer Sebastian Voltmer took this striking photo on Aug. 12, 2012. The annual Perseid meteor shower occurs in late July or early August each year. Humans have observed the celestial events for more than 2,000 years. The meteors are thought to be debris from the comet Swift-Tuttle. The debris slams into the Earth’s atmosphere and burn up on entry creating the meteor shower. In the image, one can also see several northern summer constellations in the night sky. Aquarius, Aquila and a faint view of Delphinus are all visible. The trail of the Perseid meteor points toward the constellation Perseus, named after a mythical Greek hero. The meteors appear to come from this constellation and are named Perseids after the son of Perseus.